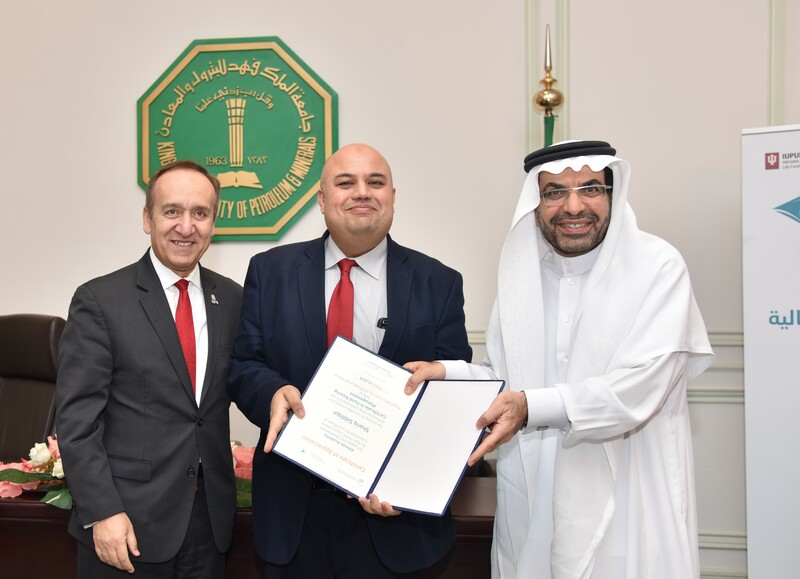 Dr. Shariq Siddiqui (middle) receives recognition for his work in bring the Certificate in Fund Raising Management to King Fahd University of Petroleum and Minerals. Photo courtesy of the IUPUI Office of the Chancellor. Recently, I sat down to talk to Dr. Shariq Siddiqui, who may have the most affiliations with the Lilly Family School of Philanthropy compared to anyone I’ve met so far! He’s an alum of both the master’s and Ph.D. program (and also has a law degree from Indiana University), he teaches courses for The Fund Raising School (including several in Saudi Arabia recently! 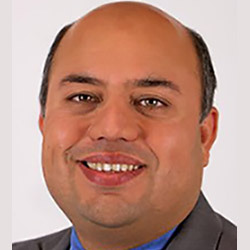 ), he is working with the Lake Institute on Faith & Giving as the newly-appointed visiting director of the Muslim Philanthropy Initiative, and he is an assistant professor at the school who teaches in the undergraduate and graduate programs. Dr. Siddiqui is also the Executive Director of the Association for Research on Nonprofit Organizations and Voluntary Action (ARNOVA), which is a leading international organization that connects scholars, teachers, and practice leaders in research on nonprofit organizations, voluntary action, philanthropy, and civil society. I spoke with Dr. Siddiqui about his many roles with the school, his advice for current students, and what he sees as the future of philanthropy. Abby Rolland (AR): When and how did you arrive at the school as a new student? Dr. Shariq Siddiqui (SS): In the late 1990s, I originally intended on pursuing law school. However, I wanted to figure out after my senior year of college how to make the world a better place. I asked my parents if I could take a year-long sabbatical before I went to graduate school, and during that time, I helped set up a mentorship program between an inner city school and the University of Indianapolis. At that point, someone pointed me in the direction of the then-Center on Philanthropy. AR: What was it like attending the then-Center as a master’s student? SS: I learned a lot and I realized I didn’t have to work as a lawyer or doctor, retire, and then become a philanthropist. The Center on Philanthropy showed me that I could spend the rest of my life making a difference. AR: Did you know initially you wanted to earn a Ph.D.? SS: No, I didn’t. After I completed the master’s and was working on the law degree, the center started talking about adding the Ph.D. program. I wondered though, who was going to study the field of Muslim philanthropy. I had had this interest in it and knew that the Muslim nonprofit sector was under resourced from a funding perspective. I thought that if I earned the Ph.D., I could be a part of the conversation and focus a light on this area of research. There’s always been a lot of energy, openness, and interest in the idea of studying Muslim philanthropy. The conversation on the topic predates me and it’s long been a part of the broader vision of the center and now school. The center and school have always thought broadly about the field and have never shied in being entrepreneurial in that way. This has led to the creation of the Muslim Philanthropy Initiative (MPI). AR: Can you elaborate on that initiative? SS: Sure! Like I mentioned, there’s always been an interest in Muslim philanthropy. We thought we could transform that interest into a full-fledged program. Our focus now is on furthering research, which we are doing through the Journal of Muslim Philanthropy and Civil Society. We want to build a manuscript collection to increase knowledge of the field. We also want to train more people, whether that’s through courses offered by The Fund Raising School and the Lake Institute on Faith & Giving, or whether that’s through the academic programs. We hope to slowly grow the program over the next five years. AR: What is it like teaching classes for the academic programs? SS: I love teaching – I love having the privilege and opportunity to guide young individuals in how they recognize their involvement in the field and the impact they plan on having during their time here and after they graduate. AR: Explain how you became involved with teaching the Certificate in Fundraising Management (CFRM) courses in Saudi Arabia with The Fund Raising School. SS: Dr. Patrick Rooney, the executive associate dean for academic programs, spoke at an annual conference at the King Fahd University of Petroleum and Minerals in Dhahran. After that, the university thought about what they wanted to do next and reached out to see if The Fund Raising School courses could be offered. The Saudi nonprofit sector is growing at an incredibly fast rate, and the nonprofit sector is emphasized as being important. As a result of those conversations, we taught three courses throughout last year and we taught the last one in February, and had a large graduation ceremony for March. It’s very exciting, because it was the first integrated course on campus, with both men and women in the classroom. My role is simply to go out and teach. Because I’m Muslim though, I have the ability to connect in certain ways and that’s helpful. To have been a part of the training and growth in the sector there is amazing. Saudis are also some of the most hospitable people you’ll ever meet. AR: Talk about your role as Executive Director with ARNOVA. SS: When I was completing the master’s program, I believed that I wanted to focus on sector building. As a result, I worked in the nonprofit sector for years, but began to question later on whether I was having the impact I thought I was. My thought on coming to ARNOVA was how can I help the nonprofit sector expand and be better? I realized research comes up with ways to make the world a better place, and the impact that research and practice together have is incredibly important. ARNOVA is a membership-based association that has over 1,200 members. It also hosts a main conference once a year, sponsors other conferences, and publishes a journal titled The Nonprofit and Voluntary Sector Quarterly (NVSQ). My main role is directing and managing the organization, but I have a great, supportive staff. AR: How do you balance everything? SS: I love all parts of my roles – I love teaching, I love research, I love my administrative role, and I love working on longer projects such as books. I live in the moment and so I love the opportunity to be able to make that moment count. AR: What are your goals? SS: I live in the moment, but for any organization I’m a part of, whether it’s as an employee or volunteer, I’m always thinking about how I can take that organization to the next level. Strategic thinking is vital. It’s my job to be constantly looking at what’s going on in the field to be able to face problems or opportunities and use them to move the organization forward. AR: What is your advice for current students at the Lilly Family School of Philanthropy? SS: First, take advantage of fact that the amazing people teaching classes are top in the field. They’re both scholars and they’re philanthropic leaders, so take advantage of opportunities to get to know them. Second, make sure that you’re constantly thinking about and processing ideas and asking more questions. Third, you have an obligation to be a leader in the field. Leadership is something that you embrace and teach yourself to grow into. Here, if you embrace the process and you embrace the frameworks that are provided, you can step into a role and setting where you can be a problem solver. For me personally, I graduated from the master’s program feeling prepared and feeling that I had an obligation to do something special with the knowledge I learned. AR: What is the future of the study of philanthropy? SS: It’s important to create processes to make the field a part of the academic tradition, but it’s also vital to continue to focus on innovation and entrepreneurialism. In essence, we should keep that flexibility around ideas and visions and mission but at the same time continue this move towards legitimacy. I also believe we’ll see more and more people who will want to spend their lives giving back. The number of people in this field is growing, and that’s a good thing. You can learn more about ARNOVA here, the MPI here, or check out Dr. Siddiqui’s new book on Islamic education and the evolution of the nonprofit sector.